The Authors Guild is a not for profit organization that represents and advises American authors. 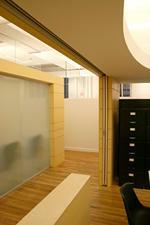 Their new office space is located in a dense area of midtown Manhattan, with restricted views and limited daylight. To take advantage of the available daylight, the top of the partitions are left open, or glazed where privacy is required, to allow as much daylight as possible to penetrate into open work stations and private offices. The central area, devoted to the storage of data and work rooms, is enclosed in walls of bright colored concrete board, file cabinets, and a display wall which form the heart of the space. 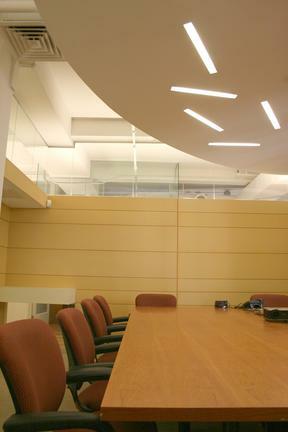 To keep the ceiling plane simple and high, fluorescent light fixtures are concealed at the top of the partitions and ceiling of the central core lighting upwards. The ceiling plane acts as a light reflector to create indirect diffused lighting, providing an even source of illumination throughout the space. This lighting condition is similar to reflected daylight. 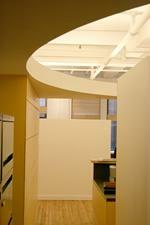 The Authors Guild’s board room features a suspended oval ceiling. White lensed light fixtures are recessed into the ceiling creating a playful and visually exciting feature.